The number of people choosing cremation has increased significantly in the past few years, yet cremation carries a long tradition and remains largely unchanged. Cremation simply expedites the process of reducing a body to bone fragments through application of intense heat. What is done before or after the cremation is up to the survivors, or up to you. You can relieve the burden of these decisions by pre-planning your arrangements in advance of need so that your wishes will be honored. Contrary to what some people believe, cremation does not limit choices, but, in fact, increases one’s options. It is a process which is performed in a respectful and dignified manner and can be memorialized in many ways. Choosing cremation neither eliminates nor does it require a funeral service. Traditional or contemporary services are often planned before or after the cremation process. A funeral service followed by cremation may be exactly the same as a funeral service followed by ground burial. They can be elaborate or simple and traditional or nontraditional. Arrangements and ceremonies tend to be as individual as the persons for whom and by whom they are made. They may be personalized specifically to reflect the life of the deceased, and thus have a special meaning. 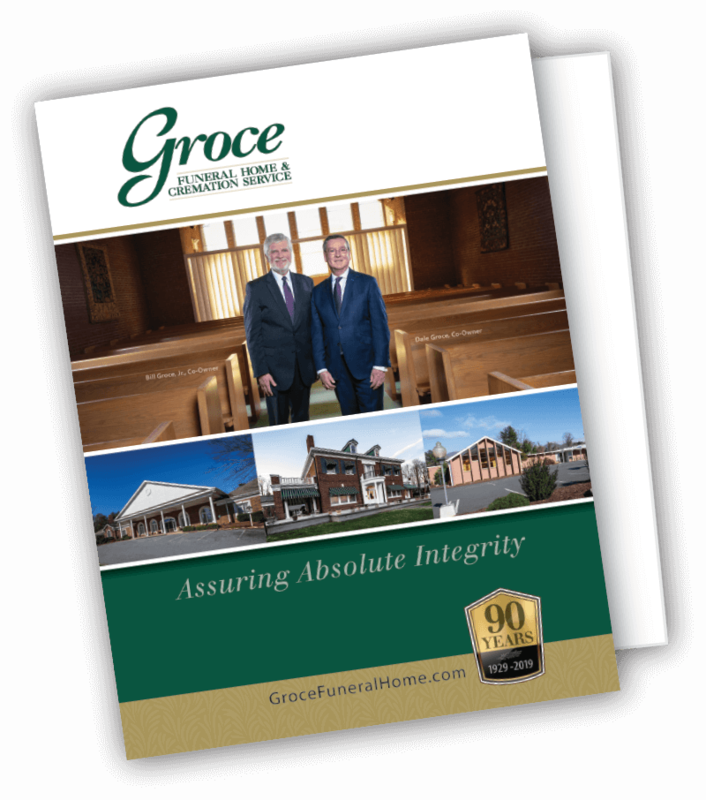 Groce Funeral Home & Cremation Service is able to assist in any and all of your Funeral Service needs. To obtain more information on funeral services click here or call 828-252-3535. The Complete Cremation Service will be just like a Complete Funeral Service except cremation will follow instead of the casketed burial. This can be accommodated by the use of a cremation casket (casket that is designed to be cremated) or the use of a rental casket. Following the viewing, service or ceremony, and eventual cremation, the cremated remains can be buried, properly scattered, or returned to the family for safe keeping. Urns are used to hold the cremated remains. Urns can be constructed out of basic materials like cardboard or plastic, or constructed out of more protective materials like basic and semi-precious metals, ceramics, and woods. The Immediate Cremation Service can be arranged as an immediate disposition of the body, but is most times followed by a memorial service at the church, funeral home or other location. A Memorial Service is one where the body is not present. We recommend that if you select an immediate cremation that you are allowed a time, if possible, to privately view the body as a family. If the viewing can be done in a matter of a few hours after the death then embalming will not be necessary. If there is to be a long delay (more than 8-12 hours) then embalming would be encouraged. If the viewing could not be done within 48 hours then embalming may be required. Viewing of the deceased is a very important step in acknowledging that the death has occurred. Having some type of service or ceremony is also a key ingredient to a healthy recovery of a loss due to a death. A Direct Cremation refers to a cremation being provided, while limiting funeral services to the removal and transportation of the deceased into our care. Memorialization provides a permanent, secure place for cremated remains to be placed, and for family members and descendants to honor the lives of the deceased. OUTDOOR NICHES – The cremated remains of your loved ones may be safely held in one of many area above ground columbarium niches. SCATTERING – Your loved one’s remains may be scattered freely within a dedicated, natural environment. There are also certain services which offer scattering among the sea or the stars. TRADITIONAL BURIAL – In ground burial on a family plot – Urns may be buried at the head or foot of a grave site. PERSONALIZED MEMORIALIZATION – Inscribe your family member’s name and a special saying on a tree plaque, park bench or other special memorial. We also have custom, unique urns and keepsakes, perfect for displaying inside your home. For an overview of these items, please visit our Merchandise pages, or contact us directly and we will help you with your needs. Contact us today to learn more or view our price list. We offer the widest range of options and services, please call 828-252-3535 to talk with one of our caring staff.